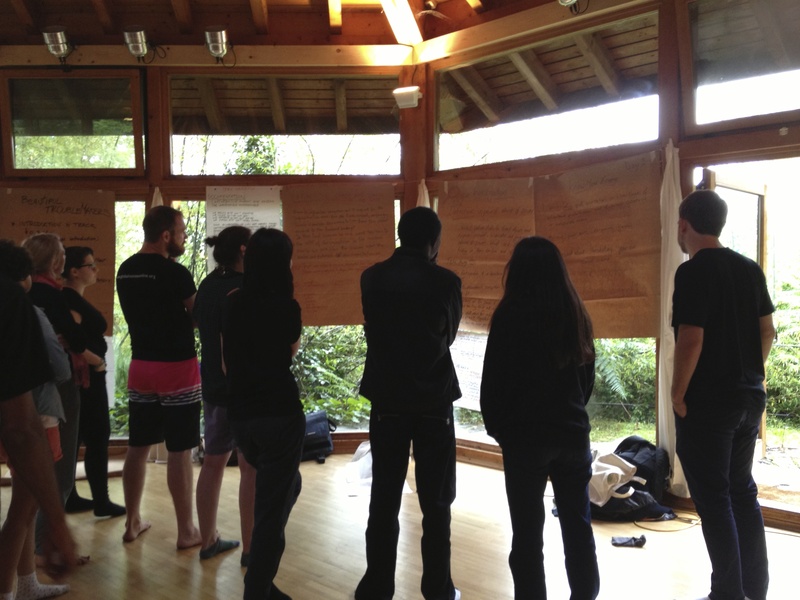 I recently attended the 2013 Info-Activism Camp as a facilitator on the “Curation” track. The Tactical Technology Collaborative organized the event for over 100 information activists from around the world. Everyone was there to learn about Evidence & Influence. Yes, it was awesome. I’ve mostly been working on Data Therapy in isolation, because I haven’t been able to find others working on capacity building for creative data presentation with community organizations. That all changed at an isolated camp in Northern Italy a few weeks ago! I connected with a network of technologists, activists, and rabble-rousers that were thinking deeply about this topic. Attendees pondering which of the awesome sessions to attend after the morning circle. What happens when you bring 100 information activists from around the world to a remote retreat in the north of Italy? We affectionally called it “organized chaos”. The organizers, Tactical Tech, have been sharing best practices in information advocacy since 2003. They run events around the world, helping activists learn how to create compelling visuals that tell their stories and advocate for their causes. Their fantastic “Visualizing Information for Advocacy” guide will be coming out in extended book-form soon. They’ve done a handful of large-scale “Camp” gatherings, the last in Bangalore in 2009. It truly is camp – we all eat, sleep, play, and work together! The large paper encouraging people to come join our curation & influence track. I was invited to help facilitate the “Curation” track, which focused on how to use information to sway hearts and minds. You know, the easy stuff 🙂 I was excited because this parallels my Data Therapy work so closely, so I hoped to share and learn in equal parts! I worked with my co-facilitators, Stephanie Hankey (of TTC) and Tin Geber (from the Land Coalition), to create an agenda for the week that was tailored to the participants interests. Of course, this was just one of 4 tracks that filled the mornings. The afternoons were filled with peer-to-peer skill-shares, and hands-on labs that focused on skill building with particular tools (for visualization, digital security, data inestigation, etc). I found the event to be just the right mix of “organized chaos” – there was a strong skeleton that set the main areas of interest, but there was ample space to change things completely based on what was working and what people wanted to learn. This is a hard balance to strike in “emergent agendas” for events; I have been part of events that have gotten it wrong a few times. This felt different, because there was strong support and collaboration from other facilitators, and the participants too (many of whom took on faciliation duties during the week). The groundwork was laid for many exciting collaborations, built on stiking similiraties between activists across the globe. Personally, I also came away with a great set of new activities, approaches, and examples for my Data Therapy workshops. Keep an eye on my Data Therapy blog to learn more about those, and upcoming workshops I plan to schedule. It was a treat to directly help people again, and to be reminded that you can’t disconnect presentation from the influence you want to create. Cross-posted to the Civic Media blog.